Recently, at Subsurface, we decided to look into the calculations of oxygen toxicity related to diving. Here is what I learned (admittedly, not too much). According to what we could find on the inter-webs, there are two things to consider: The effect on your brain (the CNS value) and on you lungs (OTU for oxygen toxicity unit). The former seems to be simply a table look-up, so there is not much to do about it. The best we could do (thanks Willem) was to do a linear interpolation of table values. For OTU, there is some thing to calculate. The empirical basis seems to be a measurement of the reduction of effective lung capacity after breathing O2 at higher partial pressure for an extended period of time. As far as we could tell, the current theory goes back the the thesis of Clark and his supervisor Lambertsen. 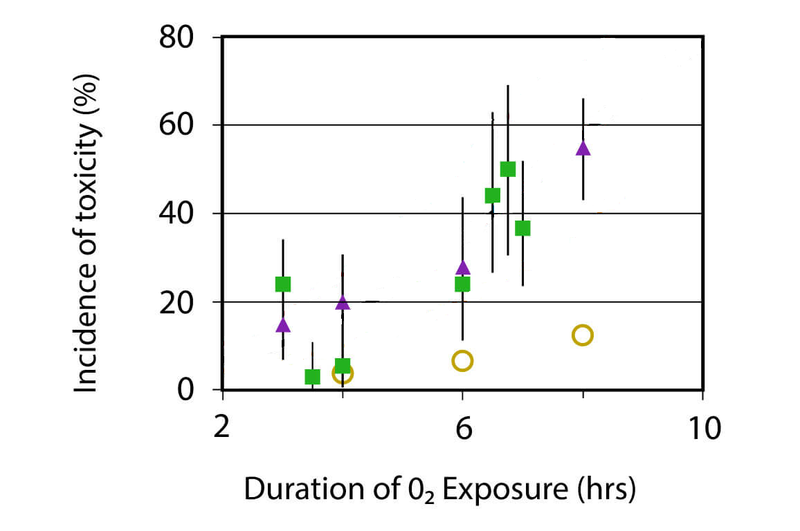 They found that there is no effect as long as the partial pressure of O2 stays below 0.5bar and any effect is proportional to the excess of partial pressure over 0.5bar and, according to their fit, it is also proportional to the exposure time to the power 6/5, i.e. You can see this in their figure 18A on page 164. There you will also spot that the linear regression is not really good. This was also pointed out later in a more comprehensive study of the Naval Medical Research Institute that found that later data but also the original data of Clark and Lambertsen was more compatible with an exponent of 1. But the 6/5 stuck in the literature and all that follows below is non-trivial only because the power is different from 1. What people then did was to take the 5/6-th root of this expression as the definition of the oxygen toxicity unit (normalised to a partial pressure of 1bar), i.e. For time varying O2 partial pressure this could then be integrated over time, as for example proposed by Erik Baker (yes, the Erik Baker of VPM-B). Again, he publishes an implementation in his favourite programming language, FORTRAN. Well except, that he uses the reciprocal of that fraction and raises it to the power -5/6, with the additional benefit of risking a division by zero at the boundary case of partial pressure 0.5bar. 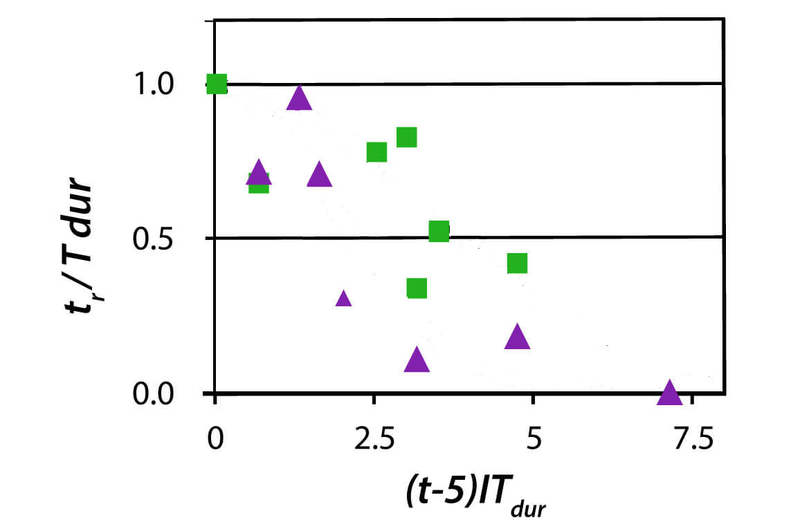 And of course, integrating this 5/6-th root makes no sense: You still get something linear in time whereas originally it was found that the damage progresses faster than time! This is Baker’s equation 2. Computationally, this formula has the disadvantage that a constant partial pressure is no longer a special case for this formula as one encounters a 0/0 floating point exception. Of course, taking a proper limit yields the above equation for the OTU but this is not convenient in a computer program. that can be calculated easily without treating the case \(p_a=p_b\) separately. Once more, all this is very likely purely academic as it is not so easy to do dives that get into the regime where OTU matters at all. That is probably also why the empirical data is so poor. Obviously, this data clearly suggests to fit it by some convoluted formula that yields a line that I manually erased from the graphs. Guess what it is and then check out the original link. Previous Previous post: Can we calculate no-fly-times?